We welcome emails or phone calls about our dogs. We will be very open and honest about their ability and current training. We encourage you to visit us and actually see our dogs in action, but we also ship dogs anywhere in the United States. We have shipped dogs to PA, FL, CA, TX, TN, CO, ME, WA, NY, LA, NV, and Canada to very satisfied clients. Many of our hunting dogs are also in various areas in MO, AR, GA, KA and OK.
Koshkonong, Missouri is a very small community is south central Missouri. We are approximately 4 hours from St. Louis and 5 hours from Kansas City, Missouri. Our location is near the Arkansas state line and we are approximately 4 hours from Little Rock, AR and 3 hours from Memphis, TN. 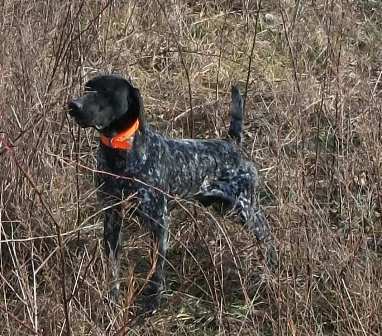 Please contact us with any questions you might have about our GSP gundogs.